It greatly affects the livelihoods of coastal communities but also sustainable development, environmental security, and sea and island sovereignty. Dr Du Van Toan from the Institute for Sea and Island Research at the Vietnam Administration of Seas and Islands said sea desertification is an urgent issue. He cited international experts as saying that preventing desertification is a task for the entire world, requiring long-term international cooperation. The United Nations Food and Agriculture Organisation (FAO) defines a marine desert as an area where all marine species die or are unable to live in due to poor natural conditions, water quality or landscapes. The first cause of sea desertification is climate change which heats up air and sea water and lowers the concentration of nutrients and dissolved oxygen. In oxygen-deficient areas, marine species usually swim away to seek oxygen-rich zones while others such as bivalve mollucs suspend activities and go into hibernation. These shellfish will die if the oxygen deficiency lasts too long. Another major cause of sea desertification is the mushrooming of coastal cities and industrial parks which generate a huge volume of solid waste, wastewater and fumes that impact air and seawater quality. Most marine deserts appear near the coast, cities and industrial zones whose activities fuel greenhouse gas emissions, increase acidification, and interrupt nutrient supply along with oxygen, nitrogen and phosphorous cycles. Ocean acidification will lead to coral bleaching and habitat degradation. Destructive fishing practices such as using explosives or hazardous chemicals damage important marine ecosystems such as coral reefs, submerged forests, and sea grass. In addition, land reclamation activities also destroy coastal forests and coral reefs. The surge of nutrients as a result of waste release from human activities also leads to a bloom of toxic red dinoflagellates, also known as red tide, which kills marine species. It takes decades, huge efforts and a lot of money to recover coral ecosystems. Too many shipping activities in one small area such as those near seaports or river mouths also wipe out animals there. US scientists found that regions with low chlorophyll, or marine deserts, are spreading around the globe, particularly in the northern hemisphere. In Vietnam, mass fish deaths have been recorded along the coast of the central provinces of Ha Tinh, Quang Binh, Quang Tri and Thua Thien-Hue, as well as at fish farms in other localities. Vietnam, like many countries in the world, is influenced by climate change and waste release from cities and industrial activities which have polluted the marine environment. 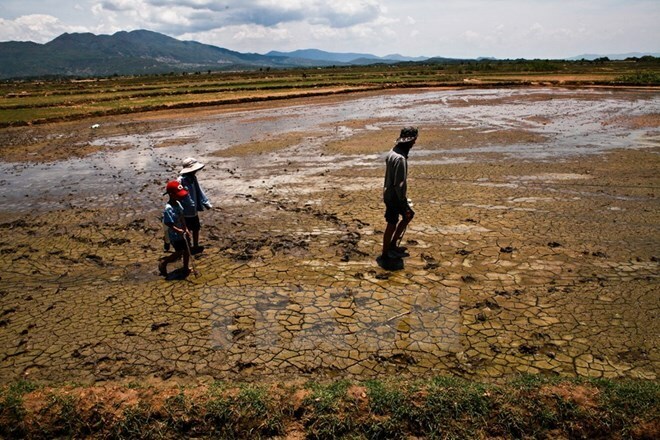 That fact shows Vietnam is likely to face sea desertification. To sustainably develop and protect the maritime environment, it is necessary to study the causes and expansion of marine deserts in the waters off the coast of Vietnam. Marine deserts also need to be classified and shown on maps. Authorised agencies should have thorough assessments of the impacts of socio-economic activities and security problems on the marine environment. Additionally, they should set up special monitoring systems for areas at risk of desertification, and enhance international cooperation on tackling sea desertification. It is important to disseminate information about this phenomenon among coastal communities and relevant organisations so that they are aware of the problem and join efforts to prevent sea desertification. Vietnam now has 16 marine protection areas (MPAs). Though they cover a small area, just 0.3 percent of total waters, they still can help maintain ecological balance if they can be managed well. Marine protection areas are believed to create a restoration effect after five years, and later create a spillover effect which helps disperse nutrients to the surrounding areas.